Quick overview What is a family? What makes someone a parent? What rights should children have? 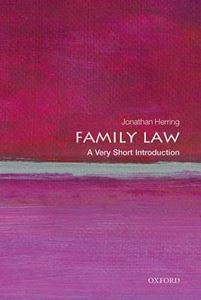 In this Very Short Introduction Jonathan Herring provides an insight not only into what the law is, but why it is the way it is. It also looks at the future to consider what families will look like in the years ahead, and what new dilemmas the courts may face. What is a family? What makes someone a parent? What rights should children have? Family Law: A Very Short Introduction gives the reader an insight not only into what the law is, but why it is the way it is. It examines how laws have had to respond to social changes in family life, from rapidly rising divorce rates to surrogate mothers, and gives insight into family courts which are required to deal with the chaos of family life and often struggle to keep up-to-date with the social and scientific changes which affect it. It also looks to the future: what will families look like in the years ahead? What new dilemmas will the courts face? ABOUT THE SERIES: The Very Short Introductions series from Oxford University Press contains hundreds of titles in almost every subject area. These pocket-sized books are the perfect way to get ahead in a new subject quickly. Our expert authors combine facts, analysis, perspective, new ideas, and enthusiasm to make interesting and challenging topics highly readable.